There are possibilities to join one of the 8 existing drumming bands. Different levels on different days. The possibility of playing regularly (twice a month) in a group of inspired drummers allows you to dive deep into the vast world of rhythm. Different aspects can be experienced from a variety of perspectives of understanding and hearing. An entry into an existing group is possible if the necessary drumming experience exists. 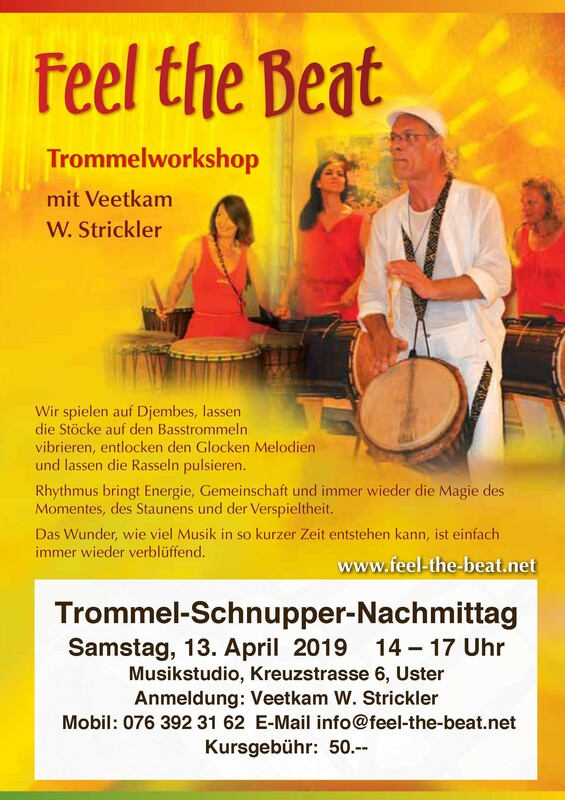 On our musical journey we will explore rhythms from the cultures of Africa and Cuba and play on the dynamic djembes, bass drums and the melodic congas. We will have plenty of time to dive into the different voices of the grooves, to feel their dynamics and move closer to their inherent magic. We will playfully learn basic techniques, rhythm understanding and how to play as a group – and be surprised at how much music can be born in such a little time. These afternoons are meant for people to follow their attraction for drumming and to try out their skills in a playing environment. Or as a stimulating musical expedition with friends or family. The motto is: Feel the beat! Plenty of instruments are available – your own are of course most welcome. These playshops will happen 4 times a year in my music studio in Uster, Kreuzstrasse 6. Sometimes a ‘one-to-one’ lesson is an ideal way to dive deeply into a subject. It can also be a solution to the problem of time in one’s daily schedule. "The heartbeat is the first sound that we hear. No wonder that rhythm feels so familiar and uniting." „ ...playing African music creates in a very short time an atmosphere of warmth, a closeness and a completely different type of relatioship between people. training with you on your great drumming lessons are among our best moments of this year. The last lesson with you was definitely a highlight :-) We already look forward to the next year´s lessons!